We have converted data from Dicom and Angiogram for CT MRI PET X-Ray scanners. The MO Optical Disks to store image information along with metadata which was extracted to a simple microsoft excel table to allow easy searching by Patient name, Operation dates etc. This relaeased the Dicom's to be easily viewable on a laptop using simple Microsoft Office and Windows type applications without special software or licence usb dongles. 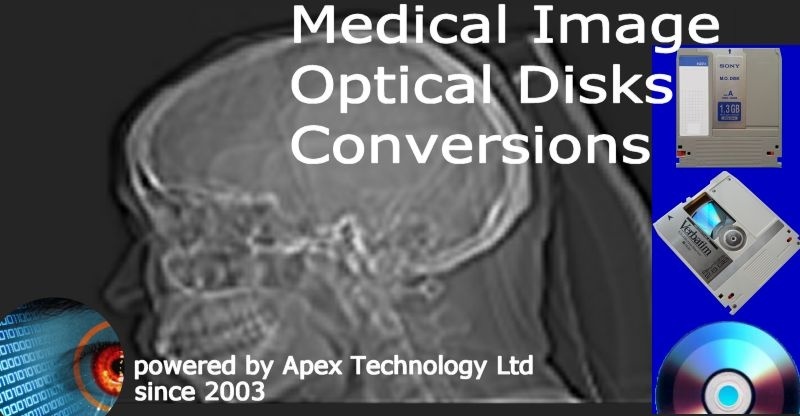 If you need a Dicom and Angiogram MO Optical Disk Conversions service, then contact our friendly company. We have converted data from Dicom and Angiogram for CT MRI PET X-Ray scanners. The MO Optical Disks to store image information along with metadata which was extracted to a simple microsoft excel table to allow easy searching by Patient name, Operation dates etc. This relaeased the Dicom's to be easily viewable on a laptop using simple Microsoft Office and Windows type applications without special software or licence usb dongles..